E-sports – wait, they’re good now? It’s been over an hour in the making. The crowd roars, the commentators scream and the final explosion signals the end of the match. What? Explosion? What sort of sport is this? The competitors are routinely butchered, sometimes multiple times in a match-up, and only the strongest is allowed to continue onwards. What sort of barbarity is this? Oh the huge manatee! Won’t somebody think of the children? Why isn’t anyone thinking of the children?! Put your writing tools away, newspaper readers and middle-class sentiments in us all, it’s only an e-sport. More specifically, it’s the DOTA 2 International competition, and I’ve just watched the previously invincible Alliance team come undone at the hands of the Asian superteam DK. Plus it’s a rather pretty game. And you can eat trees. This is my first time really watching e-sports, and I’m finding it to be a very enjoyable experience. If you’ve ever watched a sport for the first time, the process to enjoyment is much the same; settle down, learn the basic rules, and pick a side. I have some experience with other MOBA games, such as League of Legends, but the rules are easy enough to understand; two teams begin on opposite sides of the map. Each one attempts to push through to their opponents’ side and destroy their HQ. The map consists of three lanes, half initially controlled by each side. It’s a simple set-up, but it leads to some masterful strategy. Rather than relying on brute force to push through the opponents’ towers and minions, most teams play a vicious game of cat and mouse, where either side is loath to engage on weaker terms. Heroes heal slowly, and if dead, they face a hefty respawn timer, so it’s common for a fight to end on seemingly empty terms, as the aggressor runs back to their side of the map, leaving their foe alive. But often there’s a deeper strategy at play, and forcing an opponent to use their ultimate ability can be as rewarding for the team as outright killing them. It’s a game in itself to try and out figure out the strategies being played, a game that always only be improved with alcohol. An aid to the confused are the excellent commentators available on the DOTA 2 stream. Whilst they succumb to over-excitement during the team-fights, devolving into a fast stream of technobabble somewhat reminiscent of horse racing, their explanations of the deeper strategy at play and the next steps for the team is very welcome for those who’re new. It also gives you the ability to sagely nod and agree loudly, just to make you feel better, you poser. I mentioned that this was my first time watching e-sports, and the largest surprise for me was the capabilities of the platform for presenting it. Rather than watching through a video stream, I’m able to watch the match through the DOTA 2 client itself, and watching the game in this way means that lag is essentially non-existent and gives the viewer the ability to survey the battlefield for themselves, moving the camera as they see fit, or choosing to follow a specific character. Or you can hand the reins over to the aforementioned commentators, who can then talk you through the game as they show you exactly what they’re referring to. For me, this was a massive boon since I had no idea what to look for and when, plus my Easily Distracted nature. Though this match was terrible. This has surprised me. 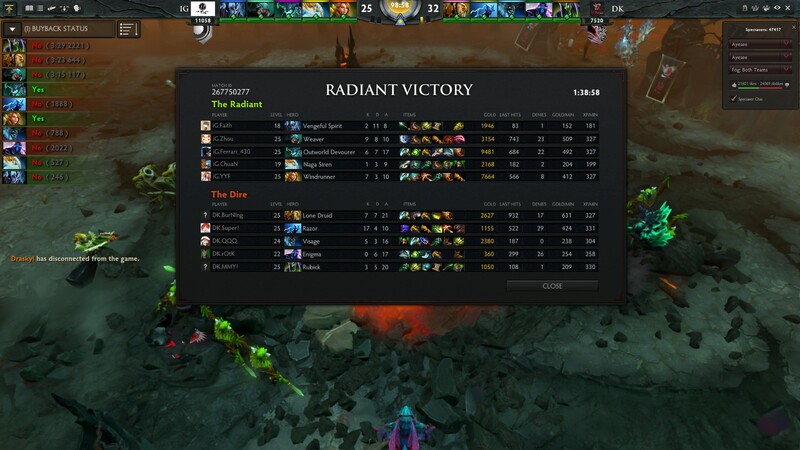 Even in this age, and with the backing of the mighty Valve itself, I was surprised by the smooth nature of my viewing. I’ve viewed several matches now, and enjoyed all of them, and it’s been the easiest thing in the world to start watching. 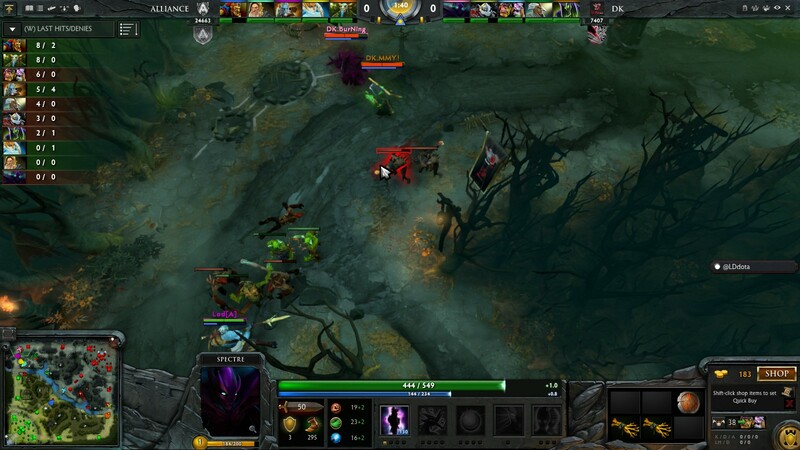 DOTA 2 is free-to-play on Steam, so if you enjoy the MOBA genre, give watching it a go. If you don’t, give it a go anyway. A five GB download isn’t that much in this day and age and if you really can’t be bothered with the download you can still watch it over at the DOTA 2 website. Grab a friend, re-read my explanation of the rules, pick a team and settle down. Once the commentators get screaming, and the towers start falling, you’ll start screaming. E-sports are as viable to watch as real sports. And I don’t know what I’m more surprised by; the fact that this is the case, or that after DK’s awful second match they managed to pull off an amazing win against Alliance. Like, seriously? I’m off to watch the third and final match between Alliance and DK. I hope to see you watching too.